1.Grind the sugar and cardamom seeds into a fine powder and set aside. the oven to 180 degree C.
3. In a bowl, combine the flour, chopped almonds, powdered sugar and salt well. 4. Next add the softened butter to the flour and mix everything to make a soft dough. 5. Divide the dough into 24 equal sized balls and press the each ball between your palms lightly. 7. Bake the cookies for 15 minutes at 180 degree C.
9. Place them on a wire rack to cool. Store in an airtight container. Its wonderful that you are using whole grains in baking. Its healthy and we can eat it too. Crispy & Crunchy looking cookies!! 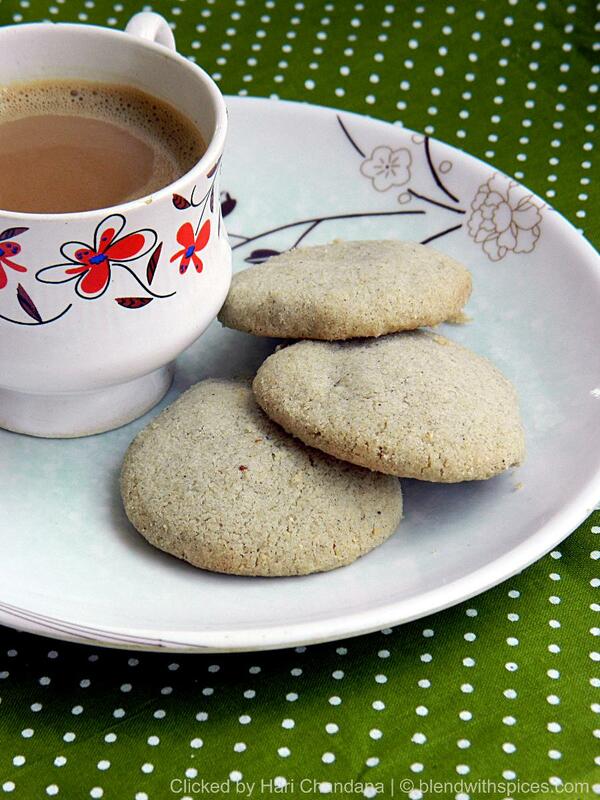 Healthy cookies,perfect with a cup of tea. Scrumptious and quite addictive cookies,love to munch some. Very crunchy, healthy cookies. Pic lovely too! I never had millet cookies I bet the flavor and texture are wonderful! Pearl millet … I'll have to wait till I go to India..don't get it here. Nice recipe.. would love to try it . The cookies look so delectable. Love the click!!! Makes we want to get the cup of tea and grab the cookies off the picture…. Splendid idea to include jowar in cookies. Would they turn out equally good if I replace butter with ghee instead? Thanks in advance. Hair Chandana, I'm absolutely loving your recipe collection! As soon as I saw bajra and cookies, I had to try this recipe and they turned out beautifully aromatic and meltingly delicious! I'm loving the Andhra sweets too:). This is how I imagine my blog would have looked if I ever start one��! Sankranthi Subhakaankshalu!